Trimming hedges with manual clippers is tiring work. With a power hedge trimmer, you’ll get more work done in less time. Our team did extensive research on a variety of hedge trimmers to help you choose the best one for your needs. We looked at electric, cordless and gas powered trimmers, as well as a lightweight option, the best overall and the best value. Each trimmer in our list includes its top features, specifications and other considerations. If you’re unsure what type of trimmer is best for you, check out our buying guide below to learn more about hedge trimmers, including cutting ability, power source, weight, noise level and cost. Read more about our methodology. 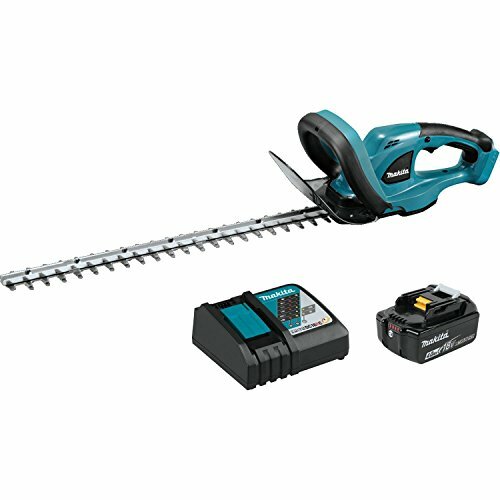 Makita is a trusted name in power tools, and you won’t go wrong with their XHU02M1 model cordless hedge trimmer. Quiet and lightweight at 7.4 pounds (with battery), this trimmer features computer controls to optimize performance, anti-vibration design and battery recharging warning system. GreenWorks receives high ratings for this low-cost hedge trimmer that includes such features as a powerful 4-amp motor, a rotating handle and a 22” blade. For a great hedge trimmer that won’t break the bank, the GreenWorks 22122 trimmer is an excellent choice. A lightweight hedge trimmer can make all the difference between an exhausting trim job and a fast, easy one. And the WG209 WORX hedge trimmer with its 24” blade, dual-action blades, three-year warranty and 5.7 pound weight is an excellent choice. The Black+Decker HH2455 electric hedge trimmer features a 24” blade to reach your tall hedges and speed up your trimming jobs. The lightweight design and the soft grip, rotating handle ensures more comfort during use. With the EGO Cordless hedge trimmer, you get quiet, powerful trimming capability with such features as a one-hour run time, 15-minute battery charge time and ability to cut through branches 3/4' thick. And this unit comes with the battery and charger. The Husqvarna 122HD60 Hedge Trimmer lets you power through your trimming jobs with such features as easy start technology, a cutting speed of 4,050 cuts/min, a branch thickness rating of .8”, an adjustable rear handle and anti-vibration dampeners. First you should consider what branch thickness you’ll be trimming. Gas powered hedge trimmers are the most powerful and can cut branches up to one inch thick. Some cordless and electric trimmers will cut up to 3/4” thick branches, but typically, 3/8” to 1/2” is the maximum thickness they will cut. You’ll also want to look at blade length, which includes 16” to 24”. If you have high hedges or a lot of trimming to do, a longer blade will make the job easier. Gas powered hedge trimmers are a great choice if you are a professional gardener or if you have a large property. They’re easily transported, they have longer operating time and you aren’t limited by cord length. The disadvantage is you have the added fuel cost, and they’re noisier. Electric hedge trimmers work well on smaller properties, but you will need an extension cord, and you have to be careful not to cut the cord. Cordless hedge trimmers are easy to use and allow you to move freely around your yard. However, you do need a battery and charger. Trimming hedges, bushes and shrubs can be tiring, so you should consider the weight of the trimmer. Gas powered trimmers are the heaviest. Electric trimmers are typically the lightest. Cordless can be heavier than electric because of the added weight of the battery. Balance is also an important factor; if the weight is distributed evenly—for instance, the motor in the rear—the trimmer will be easier to use. A gas powered hedge trimmer can be noisy, and you may have to wear ear plugs. Cordless and electric trimmers are fairly quiet. Electric hedge trimmers are the most economical choice. For under $100, you’ll find trimmers with a variety of blade lengths, from 17” to 24”. Other features may include 2.8 to 5-amp motors, dual-action blades for smoother and faster cutting, ability to cut branches up to 3/4" diameter and extension cord retainers. Cordless hedge trimmers can range from $75 to $200. Besides features such as cutting capacity and weight, you’ll want to check if the battery and charger are included, what the charge time is, and how long the charge lasts. Gas powered hedge trimmers can be the most expensive option, ranging in price from $100 to over $300. The higher priced models may have faster cutting speeds, easy-to-start motors, adjustable handles and anti-vibration dampeners. The Makita XHU02M1 hedge trimmer will tackle most of your hedge, bush and shrub trimming jobs. The cordless design allows you to move freely about your yard from front to back. Such features as the light weight, low noise level, soft-grip handle and anti-vibration design with five cushions within the motor housing help reduce operator fatigue. An indicator light shows when the battery needs recharging. With its 22” blade length and cutting speed of 1,350 SPM (Strokes Per Minute), you can trim more shrubs in less time. It cuts branches up to 1/2" thick and runs for approximately 120 minutes per charge with a low load. If you’re looking for a quiet, lightweight hedge trimmer with good cutting capacity without the need for an extension cord or gas, you’ve found it in the Makita XHU02M1. Extra design features. Features that put the Makita XHU02M1 above much of the competition include the ability to quickly change blades without disassembling the housing, five cushions in the motor housing for less vibration, battery capacity warning system and Makita’s Star Protection Computer Controls™ to protect against overloading, over-discharging and over-heating. Cutting capacity. A 1,350 SPM cutting speed lets you trim your bushes, shrubs and hedges quickly and cleanly. 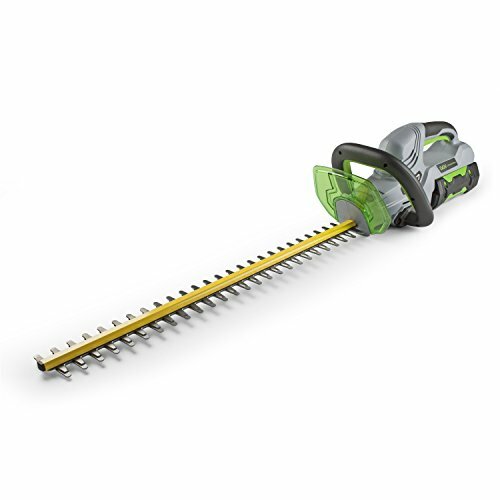 And with the 22” blade, you’ll trim more shrubs in less time. The trimmer will cut branches up to 3/8” thick. Weight. Because of the added weight of the battery, many cordless hedge trimmers can be heavy and tiring to operate. 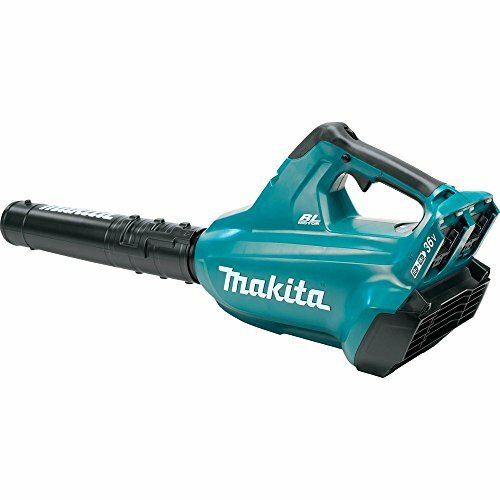 The Makita XHU02M1 weighs in at a light 7.4 pounds, including the battery. Battery and charger included. A lithium-Ion 4.0Ah battery and charger come with this hedge trimmer. The battery reaches a full charge in 40 minutes or less. And while charging, the charger communicates with the battery’s built-in chip to optimize battery life by actively controlling current, voltage and temperature. Warranty. Makita offers a 30-day guarantee and a three-year warranty on the hedge trimmer, battery and charger. Awkward safety mechanism. To turn on this hedge trimmer, you must press the lock-off button and two triggers. To turn off the trimmer, release one of the triggers. Branch thickness. The manual warns not to cut branches thicker than 10mm (.4”). Some reviewers were able to cut branches 1/2" thick, but said the motor bogged down. Otherwise, reviewers were pleased with the sharpness and cutting capacity of this hedge trimmer. The GreenWorks 22122 hedge trimmer is loaded with features you’d expect in a higher priced trimmer. The 4-amp motor provides the trimmer with enough power to cut through 3/8” to 1/2" branches with ease. And with the 22” blade, you’ll finish trimming your shrubbery in record time. Other features such as the light weight (5.7 pounds) and rotating handle make your job easier without leaving you exhausted and with sore muscles. Considering all these features, the low cost and GreenWorks’ four-year warranty, this hedge trimmer is an excellent choice. Cost. If you’re on a budget, but want a dependable hedge trimmer with great features, this low-cost trimmer is the one for you. 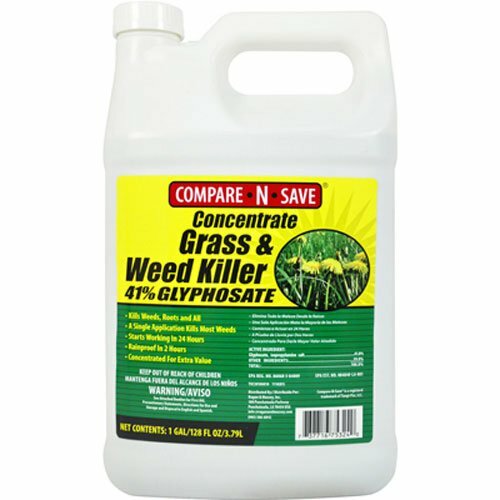 Reduces trimming time. Hedge trimming can be a tiring chore, and the GreenWorks 22122 model has features to make your job faster and easier. The dual action blades, powerful 4-amp motor and speed of 3200 SPM (Steps Per Minute) allow the trimmer to easily cut through branches up to 1/2" thick. You’ll be able to trim a broader reach of shrubs with the 22” blade. And this trimmer only weighs 5.7 pounds, much lighter than many other corded hedge trimmers. Warranty. One of the longest warranty periods for a hedge trimmer, GreenWorks offers protection for your trimmer against all defects under normal use for four years. No “on” trigger lock. Some reviewers wished there was a way to lock the “on” trigger switch. However, for safety reasons, few hedge trimmers have this option. Rotating handle use. The rotating handle may take some getting used to; otherwise, reviewers found it very useful. No blade protector. This hedge trimmer doesn’t come with a blade protector to use during storage. A lightweight hedge trimmer is an excellent choice for trimming small hedges and bushes. Safety is a big concern when using a hedge trimmer, and exhaustion can lead to accidents. A lightweight trimmer will get the job done without leaving you tired, with a backache or sore arms. For those who don’t have the strength or endurance to heft heavier trimmers, a lightweight one is a great option. If you’re looking for a lightweight hedge trimmer, the WORX WG209 is an excellent choice. The 5.7 pound weight may be the primary reason you’re considering this trimmer, but it also comes with some great features to make your trim job faster and easier. The 24” blade length lets you trim more area at once, and the dual-action blades cut through shrubbery cleanly and quickly. The dual-action blades also reduce vibration. That, coupled with the D-grip front handle, reduces fatigue. With these features and more, the WORX WG209 is a great option for a lightweight hedge trimmer. Weight. This hedge trimmer weighs in at 5.7 pounds, making this one of the lightest trimmers on the market. Cutting capacity. Though lightweight, the WORX WG209 hedge trimmer has a powerful 4-amp motor and dual-action blades that will cut cleanly and easily through branches up to 3/4" thick. Less fatigue. This hedge trimmer is designed to make your trimming job easier and faster, thus reducing your fatigue. The dual-action blades cut down on vibration, and the D-grip handle makes it more comfortable to maneuver the trimmer. And with the 24” blade, you’ll cover more area in less time, and you’ll be able to reach those higher hedges more easily. Safety. Safety features include single hand safety and operation triggers, a safety guard, and a blade sheath to not only protect the blade, but also to protect children and others from the sharp blade during storage. Extension cord required. This hedge trimmer has an 18” power cord, so for most trimming jobs, you’ll need an extension cord. No “on” trigger lock. As with many hedge trimmers, the WORX WG209 has no mechanism for locking the “on” trigger switch. Safety guard quality. Some reviewers said that the material and construction of the safety shield could have been better quality. With an electric hedge trimmer, you’ll be able to zip through your trimming chores in record time, leaving you less tired and with more leisure time to enjoy your day. An electric trimmer is easy to start, quiet and is a great option for medium-duty trimming jobs. If you like your hedges trimmed to perfection, or if you like to get creative with the shapes, an electric trimmer will do an excellent job. For quiet, precision hedge trimming, you can’t go wrong with the Black+Decker HH2455 model. Backed by Black+Decker’s quality construction and two-year warranty, this hedge trimmer makes your trimming jobs easier with its 24” blade to reach those high and deep shrubs. The soft grip handle and weight of 6.5 pounds will leave you less fatigued. The 180-degree rotating handle is another great feature. You can change the angle of the handle in 45-degree increments for making vertical and horizontal cuts. These features and more make this hedge trimmer stand out from the competition. Features ensure comfort. Several features make this trimmer easier to use. You’ll cover more area faster and reach high shrubs with the 24” blade. The dual-action blades provide less vibration overall. The 180-degree rotating handle lets you set the most comfortable angle for horizontal and vertical trims. And the lock-on switch gives you uninterrupted operation. Cutting capacity. This hedge trimmer is rated to cut through branches up to 3/4" thick. High quality for less money. For quality and value in power tools, Black+Decker is a trusted household name. And with such features as hardened steel blades plus a cost of under $50, you get high quality for less money with the Black+Decker HH2455 hedge trimmer. Extension cord required. This hedge trimmer has an 11” power cord, so you’ll need an extension cord. Motor power. This electric hedge trimmer uses a 3.3-amp motor, compared to other trimmers with a 4-amp motor. Cordless hedge trimmers are a great choice if you have a small yard or fewer hedges to trim. With a cordless trimmer, you don’t have to find a convenient power outlet or worry about an extension cord. There’s no power cord to trip over or get in the way of the trimmer blade. A cordless hedge trimmer lets you easily trim hedges while moving freely around your yard, front and back. And these hedge trimmers are your quietest option. 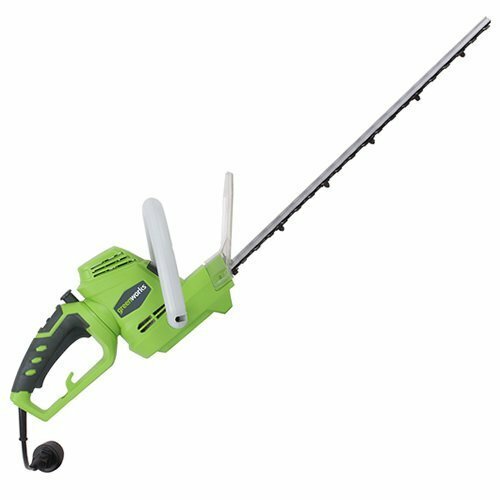 The EGO Cordless hedge trimmer is a quiet, powerful tool that cuts through branches up to 3/4" thick, operating for one hour on a single charge. Recharging the battery only takes 15 minutes. Other features include 24” dual-action blades, 3,000 Strokes Per Minute (SPM) for clean, fast cuts, weather-resistant construction and an electronic brake, which stops the blade immediately once the trigger is released. The trimmer is backed by a five-year warranty. And the battery and charger, which are included, come with a three-year warranty. Battery and charger included. This trimmer comes with a charger and a powerful 2.0 Ah 56-Volt Lithium-Ion battery, which allows you to operate the trimmer for up to one hour. The battery then takes just 15 minutes to recharge. Cutting capacity. This hedge trimmer is rated to cut through branches up to 3/4" thick. And with the blades operating at 3,000 SPM (Strokes Per Minute), your cuts will be fast and clean. Warranty. The EGO Cordless has one of the best hedge trimmer warranties. The trimmer is warranted against defects in material or workmanship for five years, the battery and charger for three years. Weight. The weight with the battery is a little over 9 lbs. A gas powered hedge trimmer is the best choice if you have heavy-duty trimming to do, for instance in large yards or if your hedges are older and tougher. Gas powered trimmers are more powerful than electric ones and will quickly cut through your shrubs. They can easily be transported and used without the worry of available electrical outlets, so they’re a good choice for professional gardeners or if you have multiple properties. Another advantage of gas powered hedge trimmers is you can safely use them in damp weather. The Husqvarna 122HD60 is a top-of-the-line gas powered hedge trimmer. Tackle your trimming jobs faster and more efficiently with this trimmer’s powerful .8 horsepower engine with a maximum speed of 7800 rpm. And starting the engine is easy with Husqvarna’s Smart Start technology. The trimmer is rated to cut through branches up to .8” thick, but some reviewers said they’ve easily cut 1” thick branches. The 23” blade, adjustable handle and anti-vibration dampeners all aid in making your trimming job easier. 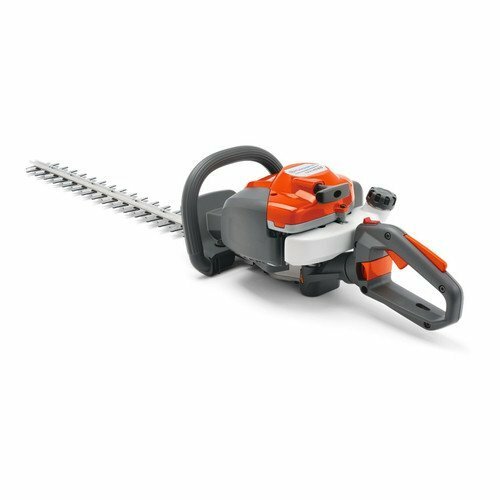 If you’re in the market for a gas powered hedge trimmer, the Husqvarna 122HD60 is an excellent choice. Powerful motor. The .8 horsepower engine, its maximum speed of 7800 rpm and the 4,050 cutting speed make this a powerful hedge trimmer for fast and efficient cutting. Easy start. Husqvarna’s Smart Start technology designed into the engine and starter mean you can start the trimmer with ease. 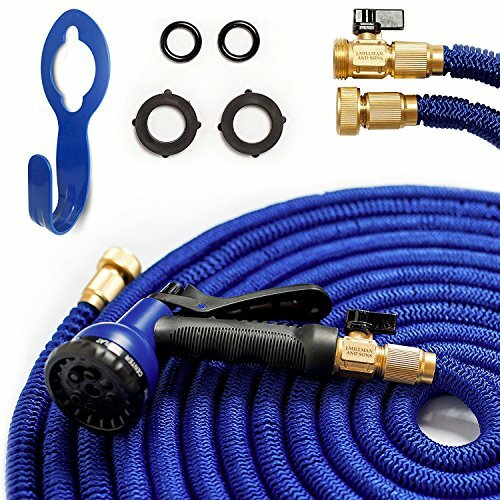 The design includes a carburetor air purge system that removes air from the carburetor and fuel system and a stop switch that automatically returns to the start position when the machine is turned off, both features making starting easier. Cutting capacity. 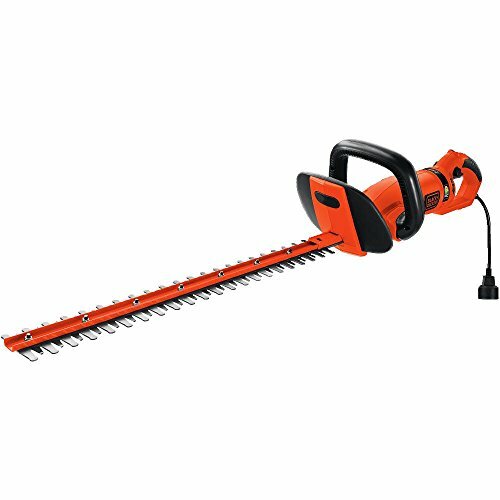 This hedge trimmer, with its powerful engine and 4,050 cutting speed is rated to cut through branches up to .8” thick. Some reviewers said they’ve easily cut branches 1” thick. Weight. Gas powered hedge trimmers are typically heavier than electric, and this trimmer weighs in at 10.8 pounds, though some reviewers said the unit is well balanced and the weight is evenly distributed. Noise level. Gas powered hedge trimmers are inherently noisier than electric.